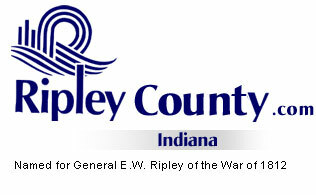 The Ripley County Council met on Tuesday, December 13th, 2005 at the Ripley County Annex in Versailles, Indiana. Don Dunbar, Council President called the meeting to order promptly at 7:00 PM with the pledge allegiance to the flag. Council Members Donald Dunbar, David Simon, Edward Armbrecht, Mark Busching and Ben Peetz were in attendance. Dephane Smith was not in attendance. Council Member Armbrecht made the motion to approve the minutes of the November 15th, 2005 meeting (after correction was made) seconded by Council Member Simon. Motion approved by those present (Dunbar, Busching, Simon, Armbrecht, Dramann & Peetz). Dephane Smith was not present. Council Member Busching made a motion to approve the additional appropriation of $12,500 from Fund#546-25800-000-526/ Uniform Vests Grant seconded Armbrecht. Motion approved by those present (Dunbar, Busching, Simon, Armbrecht, Dramann & Peetz). .
Bill Neal, Ripley County Park Board returned to the council to ask that the county subsidize the use of the Showmobile for non profit organization in Ripley County. Attorney Neil Comer suggested that they want to go with a flat fee. Council Member Armbrecht made motion to subsidize the use of the Showmobile from the endowment fund for any non profit organizations in Ripley County at $400 for the first day and $275 for any additional day seconded by Council Member Simon. Motion approved by those present (Dunbar, Busching, Simon, Armbrecht, Dramann & Peetz). Dephane Smith was not present. Council Member Armbrecht made a motion to accept the encumbrances for $659,440.44 seconded by Council Member Busching. Motion approved by those present. (Dunbar, Simon, Armbrecht, Peetz, Busching and Dramann). Council Members Armbrecht made a motion to signed the Ordinance #2005-20 Specifying Use of Certrified Distribution of Homestead Credits (in a Uniform method) seconded by Council Member Busching. Motion approved by those present.